Our gods had horns on their heads, or moons, or sealy fins, or the beaks of eagles. We called them All-Knowing, we called them Shining One. We knew we were not orphans. We smelled the earth and rolled in it; its juices ran down our chins. --from Time capsule found on a dead planet by Margaret Atwood. 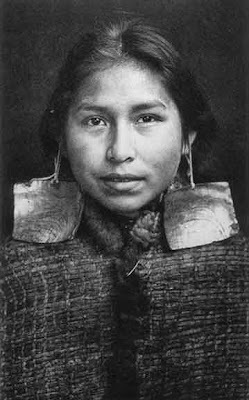 A Kwakwaka'wakw girl wearing abalone earrings and a cedar bark cloak circa 1914. Kwakwaka'wakw spirits take many forms.